This workshop is co-hosted with Or Fleisher. Web APIs and online data sets have become more available and accessible in recent years. These resources could be used for a variety of purposes, from online media projects to consumer facing products. Today’s new media projects and products are expected to be dynamic and responsive to changes in real life and in the internet sphere. Understanding how to handle a data structures and how to manage data pipelines is not only a key skill to building such experiences but also a skill that should be mastered when building any modern product. 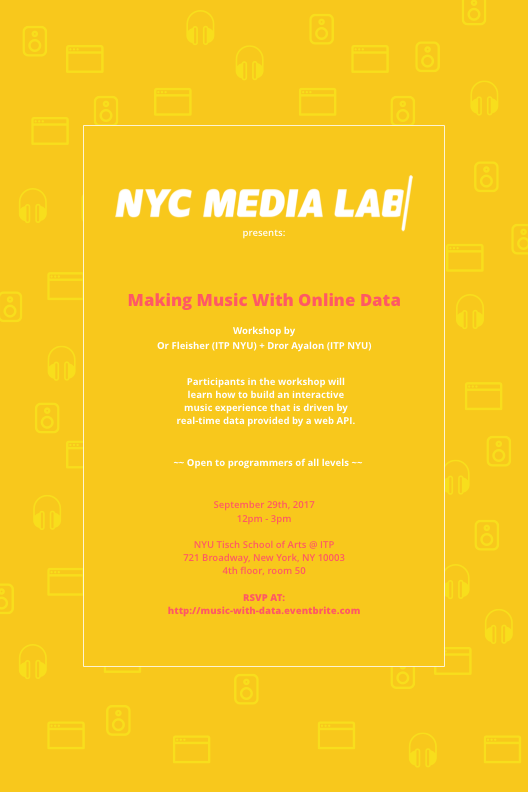 The goal of this workshop is to expose participants of all levels to the ability to utilize web APIs and online datasets to build data-driven experiences for creative purposes. We will introduce a plethora of available web APIs and together we will code a web based interactive music experience based on tweets from the Twitter API. On the second part, we will integrate with a live server to build a collaborative experience that will allow all participants to play music together by tweeting. Before we will wrap-up, we will present some ideas and projects to inspire further development.